Both men and women may experience toenail fungus from time to time, which may feature symptoms such as pain, swelling, and inflammation. The affected toenail may also become yellow in color and thicken or even crumble. Primary causes of this problem include sweaty shoes, synthetic socks, diabetes, and poor hygiene. A variety of natural remedies can be used to cure toenail fungus, of which the most common one involves the use of vinegar. Make sure you have plenty of white vinegar on hand. File thick nails gently. This will make it possible for the vinegar to penetrate the nail in a more effective manner. Apply white vinegar to the toenail. Do this one to two times daily. Allow the affected toenail to completely air dry. Remove any dead fungus from under the affected toenail on a periodic basis. Keep in mind that it could take several months for a new toenail to grow. It is important that you apply white vinegar to the nail on a daily basis until a new nail grows. Improvement should be seen within one to two weeks if you apply white vinegar to the affected toenail one to two times daily. 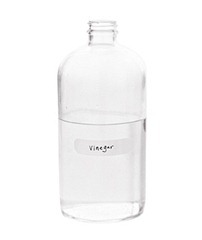 Vinegar works to improve toenail fungus due to its inherent natural acids. Simply put, fungus is not able to survive in an acidic environment. There are also many other alternative remedies that can be used to treat toenail fungus. Garlic can also be used to cure toenail fungus. This is due to the natural antifungal properties of garlic. For this treatment, mix equal parts of white vinegar with garlic oil. The mixture should be applied to the affected toe and then covered with a bandage. 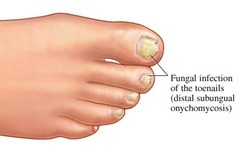 The acidic nature of apple cider vinegar also makes it an ideal treatment for toenail fungus. Mix water and apple cider vinegar together in equal parts. Soak the affected toe in this solution for thirty minutes each day. Make sure the toe is dried completely. Follow this routine each day for several weeks. The antifungal and antiseptic properties of lemon juice can put an end to toenail fungus and prevent it from spreading. Apply fresh lemon juice to the toe. Leave it in place for about ten minutes and then rinse the toe using warm water. Repeat this treatment once per day for four weeks. Fill a small bowl with mouth wash, undiluted lemon juice, and vinegar. Soak your foot in this mixture for about fifteen minutes each day. When finished, scrub the toe with the fungus. This treatment should be repeated until a new nail replaces the old nail. Combine half of a cup of baking soda, half of a cup of Epsom salts, one-fourth cup of peroxide and four cups of very hot water. Make sure all of the ingredients are properly mixed. When blended, add one-fourth of a cup of plain white vinegar to the mixture. Soak the toe in this mixture for several minutes. Next, use a cotton ball to apply the mixture to the toe and use tape to hold the cotton ball in place. This process will need to be repeated twice daily for one month.